Because its 100 years since Britain & NZ joined WWI on 4 August of this year, 2014, & because so many of our local men went away, I’ve researched another rural communities war effort. This time it’s Kakaramea. Inside the Kakaramea Hall are WWI & WWII Roll of Honour Boards, beautifully made of Rimu, & inscribed in gold letters, with the names of local men who served their country. In 1914 the population of NZ was just over one million, & more than 103,000 New Zealanders served overseas. 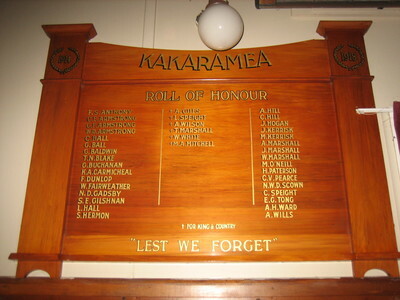 Thirty eight men with connections to Kakaramea went away to WWI, six never returned. And forty one went away to WWII & seven never returned. 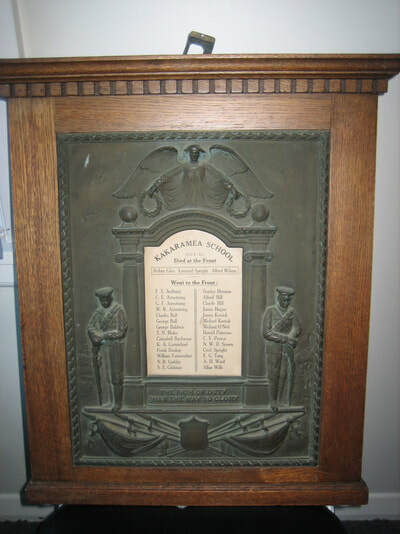 These Honour Boards were both made after WWII. 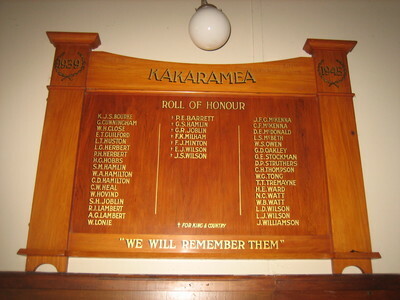 There is also a Roll of Honour tablet at the Kakaramea School of past students that went to WWI, that was unveiled in 1922 by local MP at the time, & Mayor of Hawera Mr Edwin Dixon. But even though that was made so recently after the war finished, at least one past student was missed off. That was Private Charles P Giles, 10/1824, who died from wounds & mustard gas on 27 April 1918 at the age of 24. I think he started Kakaramea School in 1901, but they have written his brother Arthur’s name down again by mistake – Arthur started school in 1899. Arthur is on the Roll of Honor in the School & the Hall, but he survived WWI. 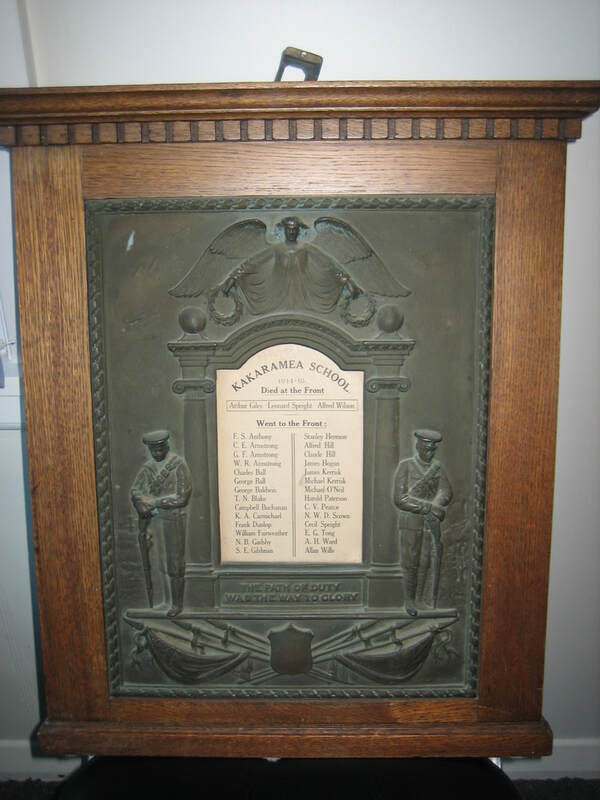 It is an error that occurs often in War Memorials around the country, especially in WWI. When you consider that around 18,500 New Zealand soldiers died in or because of WWI & about 41,000 were wounded, & then a few months after the war finished in 1918, the influenza epidemic hit, it is understandable that names were forgotten. 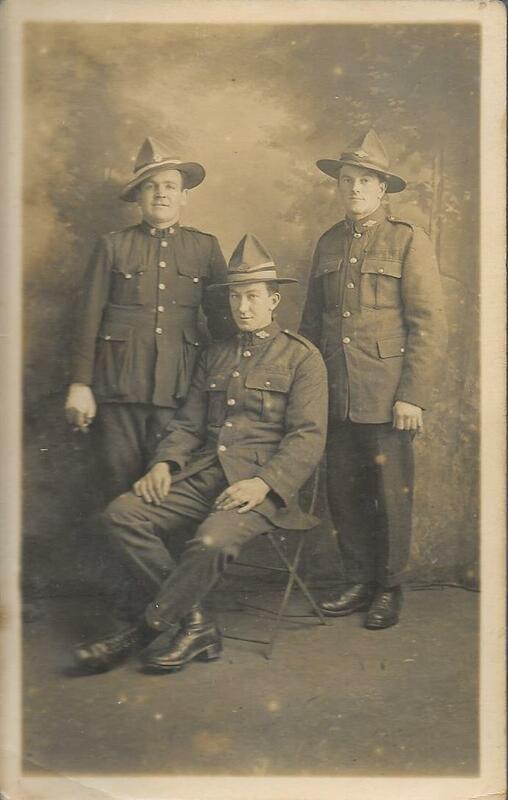 Private Joseph Speight, 23887, was also missed off the list at Kakaramea, but his brothers Leonard & Cecil are on it. They all moved with their parents to a farm in Kakaramea in 1904. Leonard died at the Battle of Somme, France in 1918. Brothers going off to war were a common occurrence, and as well as the Giles & the Speights, Kakaramea also had the Armstrong, Ball, & Marshall brothers at the War. Charles & George Ball were the sons of early settlers James & Mary Ball, their farm: Turangarere, on Lower Ball Rd is now owned by Richard Dwyer. Ball Road is named after them. Another interesting man on the Kakaramea Roll of Honour is Frank Anthony. His father ran the Manutahi Hotel in the early 1900’s. Frank & his 3 siblings went to Kakaramea School during this time. Then the family moved to a remote farm at Whakamara. When WWI broke out he joined the Royal Navy & was injured in 1916, with long term lung damage, he was repatriated back to NZ in 1918, & returned to Taranaki. In 1919, with the help of a soldiers' rehabilitation grant, Frank purchased a 76-acre dairy farm on marginal land at Midhurst. For nearly five years he struggled to improve the land's productivity. It was in the evenings, alone in his drafty old cottage on the farm, that he returned to his childhood interest of writing. His writing drew on his experiences as a struggling backblocks farmer and as a sailor before and during the war. 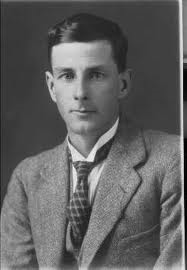 Ten of his 'Me and Gus' stories were published: classic yarns about the farming mishaps and romantic misadventures of two bachelor farmers struggling with debt & poor-quality land. Disillusioned with life on the land, he sold his farm in 1924 and travelled to England. He was also hoping to persuade Phyllis Symonds, a young Taranaki woman then in England (who had provided the basis of the romantic interest in another of his books 'Follow the call'), to marry him, but she was to remain uninterested. For two years Frank really struggled, alone and in poor health, to establish a writing career in England. He revised 'Follow the call', and turned the 'Me and Gus' stories into an expanded novel, ‘Gus Tomlins’. Despite his efforts, he was unable to break into the English market. By 1926 he had consumption aggravated by the winter climate, and he died in a boarding-house at Boscombe, near Bournemouth, on 13 January 1927 at age 36. None of his stories were published in book form during his lifetime, but his mother Annie, collected and kept his writings and negotiated the publication of ‘Follow the Call’ and the 'Me and Gus' stories in 1936 and 1938. In 1950 she made Anthony's manuscripts available to Francis Jackson, & the hugely popular radio adaptations of ‘Me and Gus’, ran for many years. Me & Gus stories were then widely read throughout the 1950s & beyond. The novel, ‘Gus Tomlins, was `published for the first time in 1977. Remembering these men who walked the ground we walk today gives us an appreciation of what they went through back then. They won’t be forgotten.